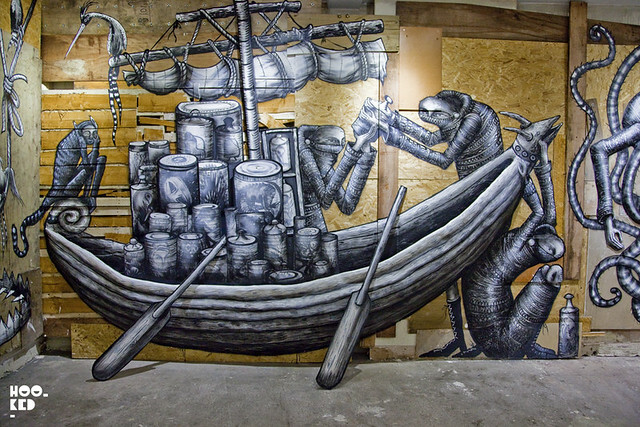 2013 was a big year for Sheffield based artist Phlegm. The artist begun 2013 with a huge mural in East London braving the bitter cold winter conditions of last January. 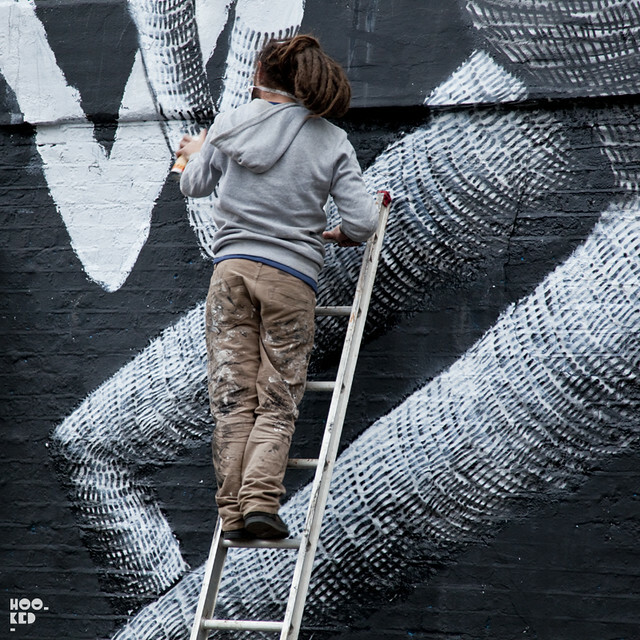 Working solely in monochrome, he spent a couple of days working on the vast wall space at Village Underground in Shoreditch. 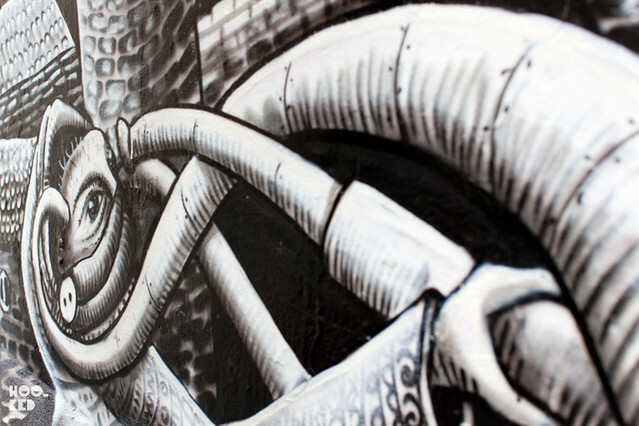 Phlegm was one of a number of street and graffiti artists invited to paint the wall throughout 2013 as part of a project curated by the Street Art London website. The year also saw the launch of Phlegm's long awaited self published book of illustrations. Beautifully produced by the artist, it featured a collection of over 80 detailed illustrated pages of his pen and ink drawings many of which if not all have appeared as murals on huge walls around the globe. The publication saw Phlegm involved in the whole process of the publication and resulted in the book being printed using vegetable based inks on lovely crisp heavy weight recycled paper. Each copy featured a hand screen print cover which were then hand embossed with the artists seal / signature stamp. We featured the illustrated book on the site back in June here where you can view some of the books spreads and cover. Should you not have already picked up a copy, there are still books available from Plegm's online web shop here. 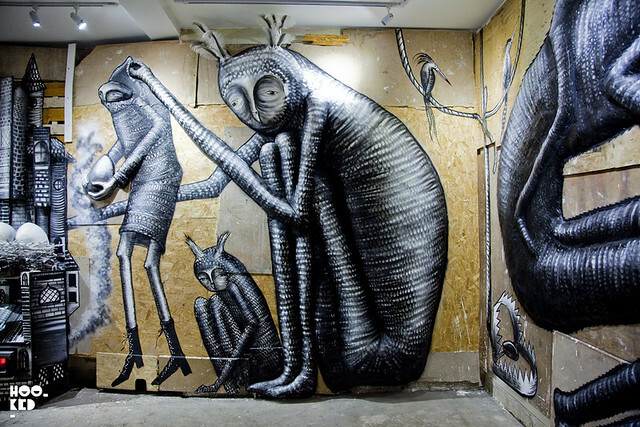 Alongside the release of his own self published book, Phlegm still somehow managed to find time to paint, returning to London again in May to redecorate the Southbank Centre's brutalist exterior of the Queen Elizabeth Hall & Purcell Room building next to the work of Belgian artist ROA who was also invited to paint the building. We briefly caught up with Phlegm as he completed work on this mural before he jetted of to Canada for the Mural festival in Montreal, just one of a number of Global festivals and events he took part in throughout the year at location such as Antwerp, Ibiza, New York, Warsaw, Cardiff, Kentucky, Vodnjan to name a few. Kicking off the new year Phlegm has returned to London, spending most of January quietly working away making and painting a huge installation in an East London space for this his first major London solo show 'The Bestiary. Having spoken to Phlegm on a number of occasions it was no surprise to us when we read the press release for the show that nothing at the exhibition will be for sale. 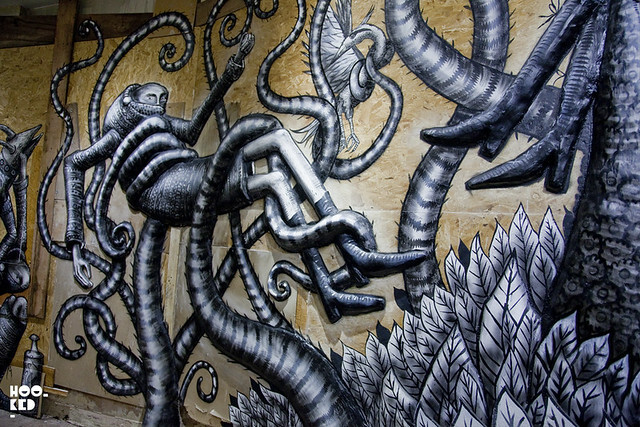 Phlegm says he wanted "to make this a show about seeing art rather than selling art. So this is a free show with nothing for sale. I just want people to come down and enjoy it!" Exhibition Opens 1 February, 6:30PM and the show will run from 1st February – 4th March 2014.